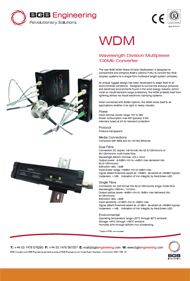 The new BGB Wavelength Division Multiplexer (WDM) has been designed to compliment the BGB Optilinc FORJ (Fibre Optic Rotary Joint) to convert two fibre (duplex) systems to a single fibre multiwave length system (simplex). Its unique rugged design has been developed to adapt itself to all environmental conditions. Designed to survive the arduous [physical and electrical] environments found in the wind energy industry (which insist on inbuilt transient surge protection), the WDM protects itself from lightning strikes via inbuilt electronic clamping systems. When combined with BGBs Optilinc, the WDM lends itself to all applications whether it be light or heavy industry. Available as a 100Mb or GigaBit converter.